Akshay Kumar and Kareena Kapoor, the lead pair of Kambakht Ishq, are all set to walk the red carpet with Sylvester Stallone at the Cannes Film Festival starting on May 13. The Hollywood action star makes a guest appearance in the flick. Stallone has been making inquiries about the release of the film. When informed of producer Sajid Nadiadwala's Cannes plan, he agreed as he is said to be extremely fond of both Akshaya and Kareena. "Is he? That's flattering. When in my early years I was working in Bangkok, I had three posters in my room - that of Sridevi, Bruce Lee and Sylvester Stallone," Akshay revealed. 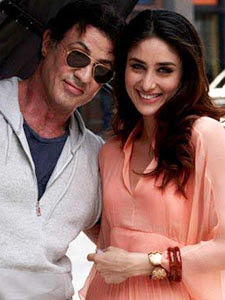 Kareena, who's currently shooting in New York, said: "It would be lovely to walk the red carpet with Sylvester Stallone. How many of our actors would get that privilege?" Brandon Routh and Denise Richards also make guest appearances in the movie, which is expected to hit the screens soon.